Vintage information: The 2017 vintage was characterized by a cold winter with abundant rainfall. At the end of April, there was a period of frost. For this reason, blossom only began to appear towards the end of May, with an earlier start on the lower slopes. Sunny weather followed, however, frost and drought eventually meant that this was a relatively challenging vintage in terms of quantity. Nevertheless, the grapes were harvested in good condition. Tasting notes: Nice garnet and red color. Expressive and charming on the nose with cherry and blackberry aromas. On the palate, the wine has a nice spicy note. The length to the finish is round and long. The grapes are grown primarily on the hills south of Vicenza, the Colli Berici, where the hillside sites ensure lower yields and better ripeness of the grapes. The vineyards are located in the hills and are south-west facing. The hillside sites experience cooler nights, allowing the aromatic compounds in the grapes to develop. The vines are trained using the Guyot system, planted on calcareous soils of volcanic origin. Average age of the vines is around 20 years old. The grapes were harvested, destemmed, crushed and then cool soaked for 24 hours. Maceration on the skins took place before fermentation at temperatures of up to 22°C. Following malolactic fermentation, 30% of the wine was aged in oak for four to five months prior to bottling. Nice with roasted or grilled beef, game and a very good companion for matured cheese. Rubus wines are a private label created and used by Kysela Pere et Fils, LTD in order to buy, bottle and market wine found at incredible quality/price ratio. 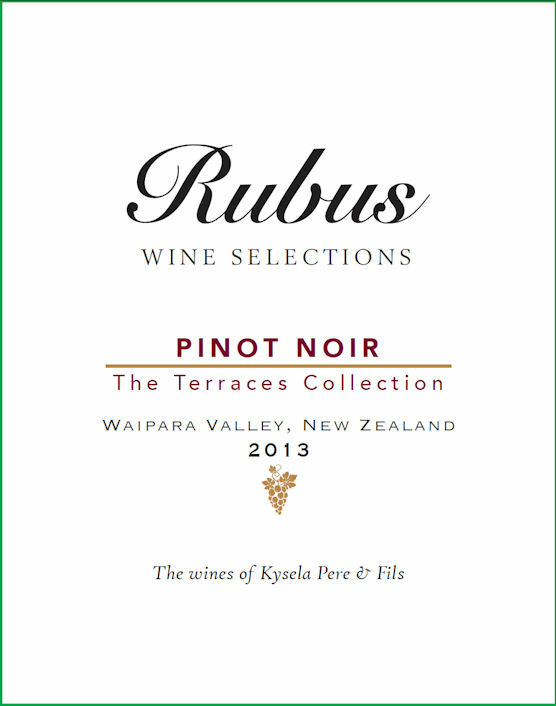 All Rubus wines are selected by Fran Kysela MS. It was first used for a superb batch of 1,200 cases of Amador county Zinfandel back in 1997. The wine sold in a few days and the Rubus brand was not used since then. We then developed the Rubus Zinfandel from Lodi (California). In 2011, we added a Shiraz/Viognier blend from the Barossa in Australia. For 2012, the newest addition to the Rubus line is a Chardonnay from Colchagua Valley in Chile. Rubus is now its own brand representing quality for the consumer and an incredible price along the way. Ribeiro blanco is produced from estate-grown grapes using traditional winemaking. Pale yellow color with green highlights. Intense white fruit aromas when young, it develops complex nuances after a few years in the bottle. In the mouth it is ample, full and pleasant with a long and fruity finish. Fermentation in Stainless Steel tank at controlled temperature. Voix de la Vigne Pinot Noir is 100 percent Pinot Noir. Vintage report: Higher than normal temperatures in spring allowed for early bloom, flower and fruit-set in perfect conditions. The last rains were waved away on the second of June and the Willamette Valley enjoyed a warm and dry growing season with temperatures never threatening over-ripeness. The harvest began in the last week of August, almost a full month earlier than normal. Grape clusters were larger than usual as a result of a very giving vintage, allowing for larger yields at high levels of quality. A twin to 2014, although a year apart, the 2015 vintage provided pristinely clean fruit with minimal ill-effects due to disease, pests and birds. With the wines showing extraordinary balance between fruit, sugar and acidity, the harmony of the 2015 vintage sets the stage for some stellar Oregon wines. Tasting Notes: Fresh raspberry aromas open immediately on the nose followed by darker fruits, brambles and a touch of black pepper. The flavors on the palate are exuberant red berries with a slight hint of dried herbs. The mouthfeel is fresh with balanced fruit and the finish lingers with a soft velvet texture. Age of the vines: between 8 and 35 years old. The fruit underwent a two-day soak prior to fermentation for a total of nineteen days of skin contact. 100% malolactic fermentation occurred over a ﬁve month period. The Vinterra Pinot Noir was produced from selected parcels of grapes grown on our Waipara and Marlborough vineyards. The fruit was harvested from March into April in excellent condition. Upon arrival at the winery the fruit was destemmed and gently tipped into open top fermenters. After a five day cool soak period yeast was added to the tanks to initiate ferment. The cap was hand plunged three times a day and the juice remained “on skins” for an average of 15 days.Malolactic fermentation and four months oak maturation were completed prior to blending and bottling. The Vinterra Pinot Noir displays ripe, earthy and berry fruit aromas as well as some sweet plum notes on the nose, following through to a full and rounded palate, displaying strawberry, cherry and dark berry fruit flavors. An excellent match for most meat dishes. Displays a compelling bouquet of strawberry, summer wildflowers, white rock, cola and the renowned Santa Maria Spice. Tender, lithe flavors of tree ripened cherry, dried herbs and hibiscus tea follow, with a mouthfeel made of pure silk. The Bien Nacido Vineyard is located in the Santa Maria Valley on the South Central Coast of California, just east of Santa Maria. The topography of the valley features transverse ranges with an east/west orientation, opening up to the Pacific Ocean. The climate is strongly influenced by the ocean providing ideal temperate growing conditions for Pinot Noir. Early spring warming, mild summer temperatures and late arriving cold fall temperatures provide a long growing season for the development of rich color along with concentrated and complex flavors. An intricately layered nose of sagebrush, blood, pencil lead, soy, beef jerky, lilac, violet, lavender and tight cranberries shows on this stunning wine from the historic vineyard. The palate offers rounded red fruits and cherry tomatoes that tighten around a sagebrush core, bolstered by lots of oregano, black pepper, dried basil and eucalyptus. Rich garnet color. Aromas of vanilla, clove and cooking spices with hints of ripe berry, pomegranate and toast. Soft entry, balanced tannin and berry fruit mingled with pleasant acidity and lingering finish. River Road Ranch encompasses 115 acres in the heart of the Russian River Valley appellation. Located on the western bench of the Santa Rosa Plain, the vineyard thrives in well-drained soils. The region's fog-cooled nights are ideal for this varietal. This Pinot Noir presents aromas of dark cherry, exotic spice, green tea and a slight earthiness we call forest floor. The wine is silky on the palate, beautifully balanced, with a long finish. The Pinot Noir's firm structure suggests excellent aging potential, 10-15 years. We made this Pinot Noir in small lots, using traditional techniques —fermenting in open-top tanks and hand-plunging the caps during primary fermentation. To accentuate the outstanding fruit flavors, we added 20% whole clusters to the each fermenter. The Pinot Noir aged twelve months in French oak barrels (40% new) from coopers Meyrieux Traditional House and Remond.